Emily + Andrew at Montalvo Arts Center from Andy Hirsch on Vimeo. Su + Ryan Wedding Highlights | Montalvo Arts Center from alumiq productions on Vimeo. Minji and Wayne | Montalvo Highlights Video from Vijay Rakhra on Vimeo. Montalvo Arts Center is the favorite wedding venue for multiple generations of Californians. 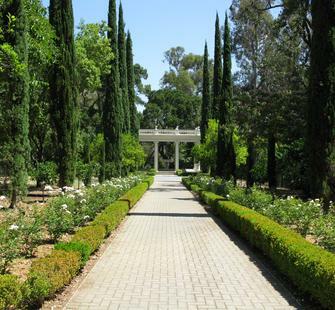 At Montalvo, you have use of the grounds, Great Lawn, Villa, Spanish Courtyard and Oval Garden or Love Temple for your dream wedding and reception. 45-minute wedding rehearsal the week of the wedding, Monday-Friday, 10 a.m. – 4 p.m. Available 2 p.m. – 11 p.m. Events can be held all year long. Upstairs dressing rooms in Villa. Rental fees are quoted based on your unique requirements, such as number of guests, time/date of event, venues used, etc. The same venues are available for private, social, and non-profit events. Rental fees are available upon request. For rental inquiries, fill out our inquiry form here. If you have additional questions, contact Caitlin Dieni: cdieni@montalvoarts.org or 408-961-5829.